I remember it like it was yesterday. Three years ago I was headed back to my office after meeting with a new client. It was a beautiful fall day and the leaves on the trees were at their most glorious. I was stopped at the intersection of 63rd Street and Ward Parkway Boulevard. Two cars were ahead of mine and our light was red. After a few moments, the light turned green and the cars ahead of me moved forward. I followed behind them and started to cross over the first two southbound lanes of Ward Parkway. Out of the corner of my eye, I saw a blur. It was a fast-moving SUV and at that instant I knew it was going to slam into the side of my car. I instinctively hit the gas pedal and prepared for the impact. Handling transportation-related personal injury cases (semis, trains, cars and motorcycles) for nearly 25 years, I have seen my share of crushed vehicles and resulting medical records and even autopsy reports. I knew the collision I was about to be involved in would be severe. Yet, somehow the SUV missed hitting my car by inches. After the close call, I saw through the rear window of the SUV the driver throw his hands up in the air as if to say “I am so sorry. I never even saw you.” How is it possible for a driver to run a red light in broad daylight by several seconds when there is nothing to block his view of the light? In most instances, the answer is simple: distracted driving. What is “distracted driving”? The website www.distraction.gov, which is the United States government’s official website for distracted driving, defines it as “any activity that could divert a person’s attention away from the primary task of driving.” It provides a list of nine activities, including texting, using a cell phone, reading a map, using a navigation system, adjusting a radio. In 2013, 3,154 people were killed and 424,000 were injured in motor vehicle crashes involving distracted drivers. 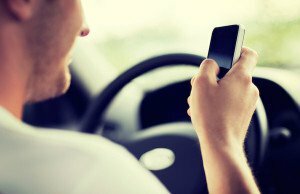 Engaging in visual-manual tasks (such as reaching for a phone, dialing and texting) increases the risk of getting into a crash by three times. Five seconds is the average time your eyes are off the road while texting. At 55 mph, that’s enough time to cover the length of a football field blindfolded. At any given daylight moment, approximately 660,000 drivers are using cell phones or manipulating electronic devices while driving. The picture painted by these numbers is ugly. Most people believe there is too much texting while driving – even people who do it themselves. It is the rare occurrence when I’m driving somewhere and do not see a driver in a car looking at his or her phone. What can be done about this? Don’t contribute to this growing epidemic by texting while driving. Those of us in our 40s and older somehow managed to drive for 20 years without having to talk on a phone, answer a text message or look at a picture on Instagram. It can wait. And always drive defensively. Knowing that many others are behind the wheel of 4,000 pound vehicles and are texting while driving, be on the lookout for someone who places a higher value on keeping tabs on his social network more than his own safety, as well as the safety of the rest of us on the roads. Not all car collisions are caused by distracted drivers. But if you have been involved in a collision that you suspect was caused by someone driving distracted, we have the knowledge and experience to find the evidence that will confirm that suspicion. If you have questions or if we can help you with your claim, please give us a call or send us an email.